A VW-powered motorcycle might seem folly until you see the name Von Dutch inscribed on the machine. You know then there must have been method behind the madness. Von Dutch is undoubtedly one of the most influential artists and fabricators in hot rod history, yet his life remains shrouded in mystery, largely due to his self-imposed isolation. One thing is for certain though – anything he built, pinstriped or hand crafted is highly coveted by collectors today, and only a fortunate few own a piece graced by Von Dutch’s hands. Most are in the form of a pinstriped article, such as a helmet, or a motorcycle fuel tank, or a car, but the real prized gems are his hand built knives and guns. But how about something designed, built, striped and actually used by the man himself? 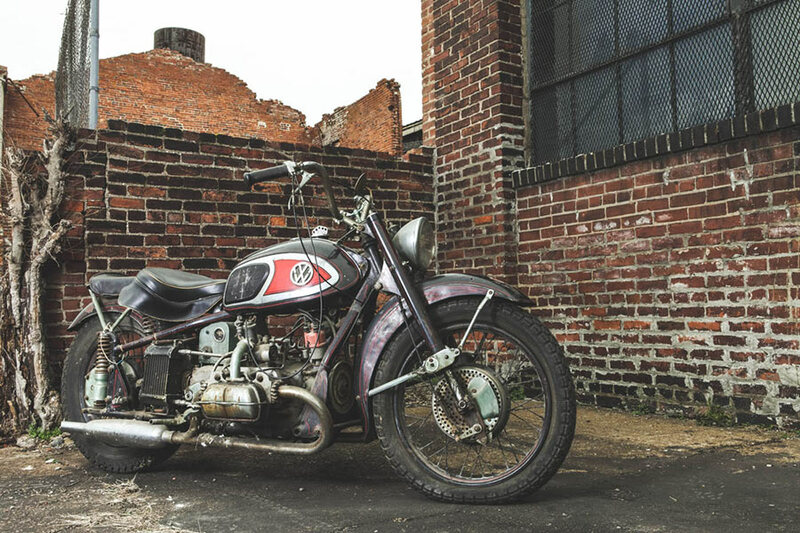 Mike Wolfe of the History Channel’s American Pickers has uncovered many amazing and forgotten relics in his life, but nothing that saw him as excited as the motorcycle you see before you, Von Dutch’s personal ‘XAVW’. 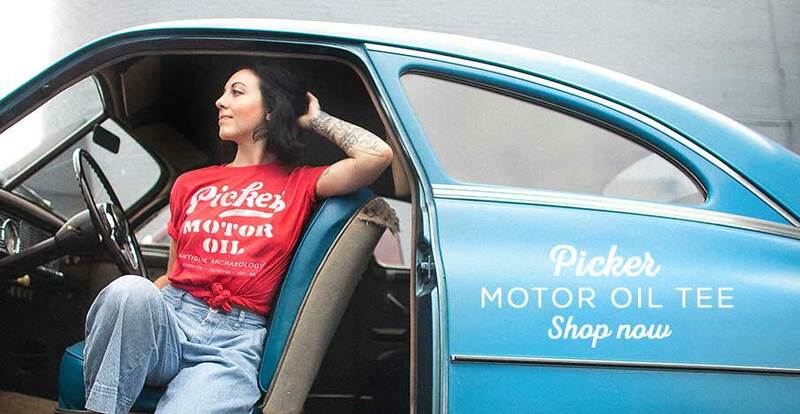 The story goes Mike received a telephone call one day from a gentleman whose property he had recently ‘picked’ telling him about a woman who had a VW-powered motorcycle built by Von Dutch sitting in her barn. At first he didn’t believe it, or thought it must be a trike of some sorts, but the gentleman assured him the engine sat between your legs. Mike did a quick bit of research online and discovered Von Dutch had in fact built just such a motorcycle. Needless to say, he was on the road before the keys cooled on his keyboard, and what he found surpassed even his wildest dreams. Not only was the story true, the motorcycle was complete, having been re-assembled in 1969 by one Randy Smith, who purchased it from another iconic and larger than life character, Ed Roth. When Randy and his wife moved to Tennessee, they took Von Dutch’s old bike with them and parked it in their barn, where it sat for some 30 years. This incredible survivor was built in 1966 while Von Dutch was ‘in hiding’, working at an undisclosed motorcycle shop in Southern California. Besides simply wanting a project he could learn from, the objective of the bike was to pull a side car allegedly designed for a horse to ride along. I know, we find that a bit hard to believe as well. 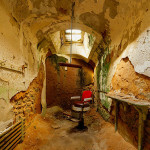 Not having any money, and in fact intensely disliking the whole concept of money, the machine was assembled from discarded components found in junkyards, along with components he designed and fabricated himself. Was the Von Dutch Motorcycle a waste of effort? As Custom Chopper magazine reported in May 1971, everyone at the time was trying to take stock old bikes and modify them to make them look exotic, Von Dutch’s idea was to turn that concept on its head and use parts of exotic European bikes and make something that looked stock. In a rare interview given to Modern Cycle magazine around the time of its construction, Von Dutch himself admitted its folly: “This Volkswagen motorcycle seems like a complete waste of effort unless I explain my own rationalizing,” he commented, before explaining that the VW engine provides its power nice and low down the rev range, unlike motorcycle engines of similar power output. His criteria for the build were as follows: “The machine must kick start, and not be too long overall. It must have conventional controls, good brakes, good electrics, and a riding position that doesn’t require an acrobat to handle it. It must be reliable through proven engineering and have an effective range. 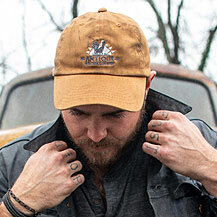 Last, but far from least, it must be economical both in original cost, and operation, for I cannot yet rationalize expensive vehicles that transport me to someplace I don’t really need to go.” That last part is classic Von Dutch. Perhaps unsurprisingly, given the original objective, the design didn’t work out quite as planned, which apparently greatly upset Von Dutch, so much so he tore the XAVW apart and pushed it into a corner, though the article in Custom Chopper suggests he made plans to build another similar bike for a customer using a Porsche Spyder engine, and this is backed up by this closing statement of his achievement. “The motorcycle was built for the purpose of fun and gaining knowledge rather than as a statement of accomplishment motivated by human competition. …if some urge for great but useless power for the sake of status symbol overcomes my logic, a Porsche engine will also fit.” From this, and comments made about it being a “very smooth, tractable machine,” we can at least deduce he was happy to have finished the project and put some miles on it, even if it didn’t fulfill the alleged original remit of transporting a horse. Like so many works of disillusioned inventors, the disassembled bike was never re-assembled, but instead was purchased by, or more likely traded to, custom car builder / Monster t-shirt legend, Ed ‘Big Daddy’ Roth, whose name remains on the pink slip (registration document) today. He had enough wild ideas of his own though – many of them VW-powered too incidentally – and so it appears he only kept the collection of parts for about three years before selling them to Randy Smith. What we can only imagine is the look on Mike Wolfe’s face when he saw the motorcycle in person for the first time, and read the hand-lettered ‘Von Dutch conversion 1966’ on the front fork neck. 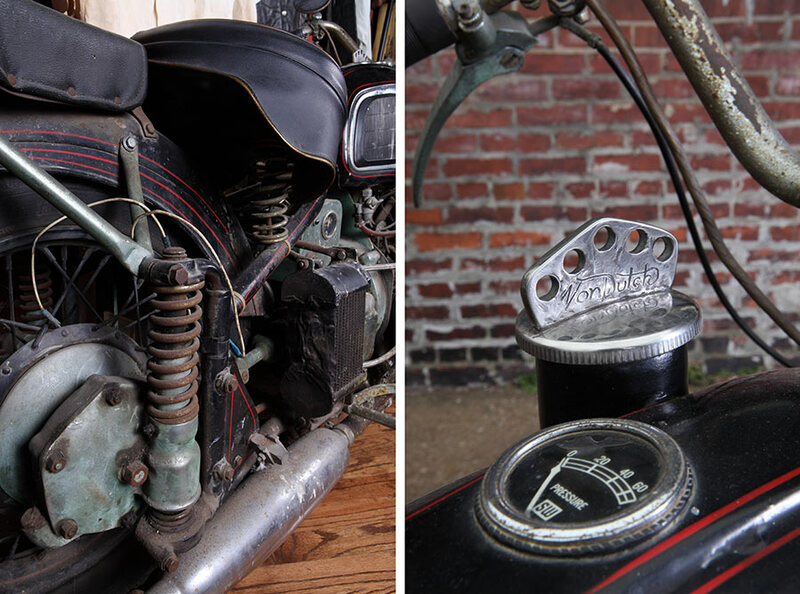 With Mike’s deep-rooted passion for early American motorcycles, as well as air-cooled Volkswagens, this was the ultimate barn find. The rest of the world can count their blessings that Mike ended up with the bike as well, as rather than this valuable piece of Von Dutch memorabilia being locked away in a private collection, or worse, stripped and unnecessarily restored, it is now on public display at his Antique Archaeology business in LeClaire, Iowa. Under Mike’s ownership, the XAVW will retain every hand-laid stripe, every hand-formed panel and every characteristic flaw collected in its nearly 50-year history. 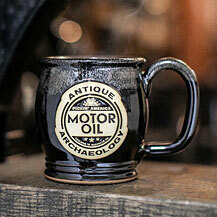 It has already and will no doubt continue to make a few appearances at selected shows in the future but, should you ever have the opportunity to visit Antique Archaeology, you can see this historic time capsule in person. Believe us, it is well worth the drive. So what exactly is it you are looking at? The basis of Von Dutch’s XAVW is a 1942 shaft drive Harley Davidson XA, the bikes built by Harley for the US Army to use in North Africa campaigns. To this was added an Italian 1951 Moto Guzzi front end and wheels and a Triumph rear mudguard, while slotted in place of the old V-twin motor is a 1200cc 30-horse VW engine. This was left essentially stock by Von Dutch, though the compression ratio was lowered to account for the lack of a cooling fan and a rather unsightly – though apparently very efficient – aircraft oil cooler he found in a dump was bolted to the offside, just aft of the gearbox. As the stock Solex carburettor would have hit the top tube of the frame, Von Dutch cut down and modified the original inlet manifold to take two modified Amal monobloc motorcycle carburettors. He also added a Vertex magneto and Bosch electrics, plus, “a whole lot of twisting, bending, welding, grinding and hammering. The only modification Smith made when he recommissioned the bike was to 8-dowel the crank for security and replace the missing magneto with a distributor from a Porsche 356. The only alterations necessary to the Harley frame to fit the VW engine was to spread the lower frame tubes slightly to clear the sump of the crankcase, while the original XA 4-speed gearbox was moved back some five inches, with the driveshaft shortened to suit. Naturally, an adapter plate was necessary to mate the VW engine and Harley Davidson transmission, and Von Dutch made that himself, along with numerous other brackets and smaller components to mate up all the control gear. A 1964 Honda 450 gave up its fuel tank to the cause, but not before Dutch had replaced the Honda wing logos with those of VW, and added some of the pinstriping he is so well known for today. So what was it like to ride? According to Randy Smith, it had fantastic torque, smooth suspension, very little vibration or noise (thanks to the use of a pair of Triumph motorcycle silencers) and was extremely well balanced. The only concern was the position of the rear brake pedal near the exhaust. Just who was Von Dutch? 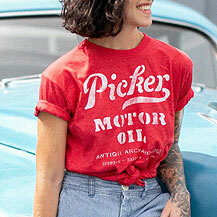 If you thought Von Dutch was a clothing label then allow us to educate you. 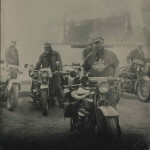 Von Dutch was in fact Kenneth R. Howard, an eccentric, gifted, imaginative, painter, motorcycle builder, gunsmith, draftsman and artist who was notoriously cantankerous from an early age. 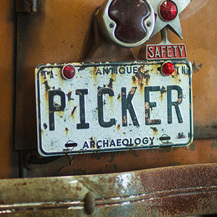 Born in 1929, the son of a successful sign painter, he hated money, and had no time for the trappings it brought, preferring to live in near abject poverty most of his life, seeing out his days in a converted Los Angeles city bus, which was more workshop than camper, in the grounds of the Bruckers’ Movie World, Cars of the Stars and Planes of Fame museum in Buena Park, California. He is credited as being the originator of so-called ‘modern’ pinstriping, having brought the ancient technique of coach lining to the forefront of underground custom culture. In truth though, that is where it, and Von Dutch, could easily have stayed had the Laguna Art Museum not put on an exhibition entitled ‘It’s Not Art, It’s L.A.’ in 1993, a year after his death. Much of the artwork and artifacts on display were of Kenneth Howard’s design, and many came from the private collection of the Brucker family. This lifted the lid on Von Dutch’s world and brought it into the public eye for the first time since 1970, when West magazine commissioned photographer, Richard Karl Koch, to shoot a motorcycle fuel tank painted by Von Dutch with the West logo for the cover of the magazine. The reason for the feature? Many people a the time thought Von Dutch had died. In fact, he lived a further 22 years, much of it on his ranch in Calabasas, north west of Los Angeles, but later in Arizona, was for a time good friends with actor Steve McQueen, and raised two daughters, Lisa and Lorna, with his wife, Sheila. Though details are at times contradictory, the story goes his daughters sold the rights to reproduce their father’s name and flying eye imagery (itself unashamedly adapted from the ancient Egyptian and Macedonian all-seeing eye) in 1996 to a clothing maker, Michael Cassel, who started Von Dutch Originals soon after. With Diesel designer, Christian Audigier, on board, the brand went global and reached a far wider audience than Cassel ever imagined. Would Von Dutch have approved of the likes of Jordan and various ‘celebrity’ footballers flaunting his name? In a word, no. Oh, and the name? 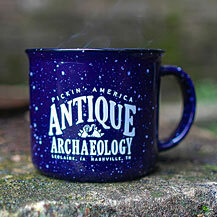 It is said to have originated from an old and mildly offensive slur, ‘as stubborn as a Dutchman’. So now you know. “Goin’ Dutch” originally published on Volksworld.com. 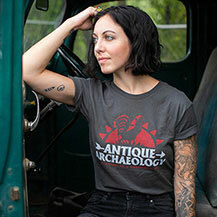 Antique Archaeology shirt is for the ultimate picker and motor oil fan. 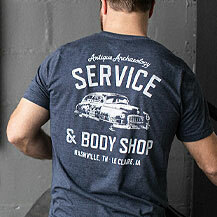 Includes zip codes for both Nashville and LeClaire stores. 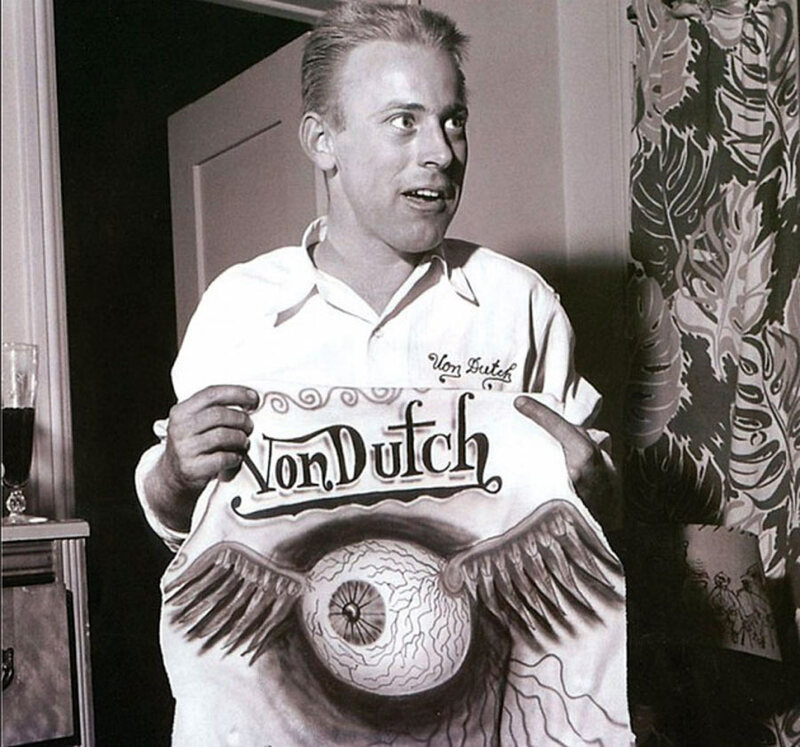 For posting this fascinating story of legendary “Von Dutch”. Having become aware of his eccentric life style and his humble personality in a article that had appeared in a biker magazine back in the early eighties …I think “Cycle World” makes this a unforgettable piece that you have done as well.I have great respect for what you have dedicated your life to, also, American Pickers stands very tall and is as grass roots American as apple pie. You are the person most deserving of having this one of a kind old Von Dutch original piece of iron. I hope to see it one day too. Fellow biker and true American Picker fan …Bill Bennett …Georgetown, Oh. keep the show going dude and keep us updated on ur finds. do u have a private room of ur greatest finds that are priceless?? Thanks for the wave of compliments, Jason! As for your question, a large amount of the picks are on full display for anyone who visits the Le Claire or Nashville shops. How convenient is that? See you soon! i remember hearing about ed roth and the vw bike.years ago.i have a cousin named larry roth and another named ronnie roth.their father milton and their mother millie died years ago.i like the cartoon character ratfink. Gracias & Excelente Story on Dutch. 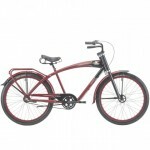 The Von Dutch bike. Four something so rare, and only to have had four owners, possibly five, is a real kick love this stuff. Same here, Bernie! Glad to have you as a fan. Hallow, and Happy New Year..
had one or more ever since. This brings me to the “Von Dutch” scoot, Got to tell ya….the first I seen it, not imprest. I did know Von Dutch’s work in fact had a 56 Lincoln striped by the Man, but in 1968 vw’s found there way into all kinds of things. mostly Trikes so when Tom Burke showed it. Hmmmm ok..neat and went on.Tom had a ton of kool stuff…ask him about a scoot he built in 70. a reall nice Pan,with a two up seat..and in the humpseat was a space for a tool pouch.Blew my mind..
Mike never stops amazing me he no’s so much about almost everything, and I respect him a lot for all the thing’s he no. I love the show and wish i was young again and healthy enough to do what you do,I even watch all the rerun’s in case I missed one. you are doing my dream but a motorcycle accident in 1973 stopped all that. keep up the good shows I love them. I hope you Mike and Frank stay togeather for along time. Thank’s for the shows. your bud Little John English. 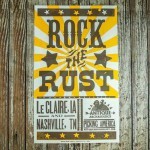 Thank you Mike for posting the article about Von Dutch and the history of the bike.I fortunately got to see the bike at Antique Archeology in Nashville earlier this year,while on vacation,and got myself a Von pickers shirt.I am planning on moving to Tennessee next year and will be a more frequent visitor there.I love seeing the rusty gold you all find. Can’t wait to see you, Kevin! Gteat article. Enjoy the show – more the people you meet that the items you find. Keep up the great work. Interesting to see the Von Dutch VW motorcycle reserface after all these years. In 1966 I was a pardner with a small machine shop in Reseda, California and a friend of a friend knew Von Dutch (then living in Reseda) and knew that he had an aluminum casting that he wanted machined to adapt a Volkswagen engine to a motorcycle that he was building. He said that Von Dutch liked the barter system and that he would trade some pin striping for the machine work – I said that I would do it. I had a nearly new 1966 VW Bug at the time and when I completed machining the casting I delivered it to Von Dutch and asked him if he would do a conservative striping job ion my VW – he agreed. The car was dark green and he striped it in light gray (to match the interior), he striped around the windows, the roof line, the belt line and around the fender openings, nothing too wild. The VW had a emblem on the hood lid (rear) that stated “1300” meaning the engine size of 1300 cc. 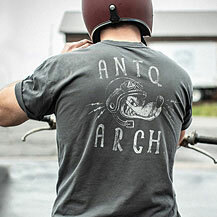 Von Dutch carefully printed under the 1300 the word “HORSEPOWER”. i kept the car until 1973 at which time I sold it to a fella buying it for his daughter to drive to high school. At the time I did not realize the value of a Von Dutch pin striping job. I never saw the car again and often wondered what ever happened to it. Today the car would be worth big bucks as a piece of Von Dutch artwork! Ed “Big Daddy” Roth in terms of modern art seems to have been influenced by Walt Disney, Pablo Picasso,and Salvatore Dali. His creation Rat Fink has been called an anti hero reaction to Mickey Mouse. For historical mention, actress Cyd Charisse real name was Tula Ellise Finklea. I am left wondering if a two cycle Saab engine could not have been used to do the same thong. It is also interesting that this Frankenstein was done without either concept drawings or blueprints.